Don't call the fire department, it's just custom wallpaper burning up your walls. Today's custom wallpaper image inspiration is smoke; another instance when custom wallpaper allows you to decorate in exciting and unexpected ways. Smoke has a mysterious, sensuous look. 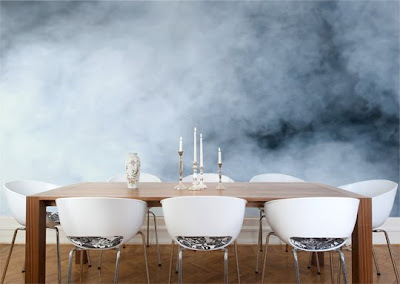 Printed as a custom wall mural, a smoky look is the perfect backdrop for a titillating dinner party. The smoke in the wall mural in the inspiration room above is tinted with a hint of blue, but could just as easily be presented in pure black and white. Or, a touch of magenta could be used to give the smoke more of a warmer feel. The ethereal, romantic feeling of smoke and fog always reminds us of the Hudson River School art movement. The atmospheric effect that mist and fog had in these paintings is what truly made this landscape style stand out. Capture the essence of this style as a custom wall mural to give your home the same gorgeous sublime look that Thomas Cole himself would appreciate.